The NFL’s first full week of preseason action began with a few players continuing to cry out for attention. 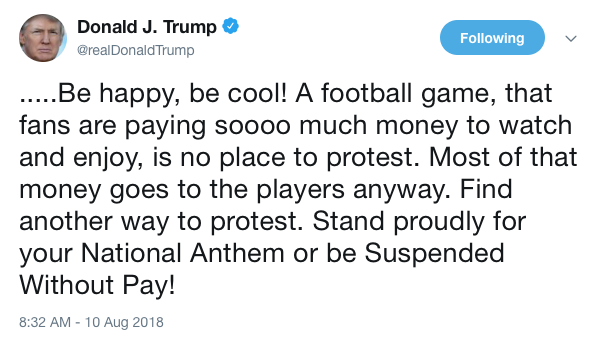 At this point, the protests have lost their meaning, and it seems as though some players are continuing their protests just to spite President Trump’s stance against it. Three Miami Dolphins players — defensive end Robert Quinn and wide receivers Kenny Stills and Albert Wilson — protested during the national anthem. Quinn raised a fist in the air, while Stills and Wilson reportedly took a knee. 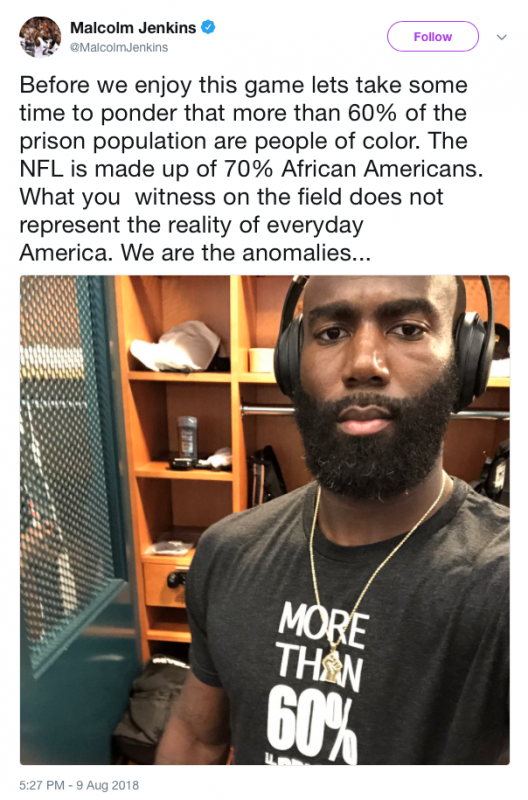 The Philadelphia Eagles resident protester safety Malcolm Jenkins continued to raise a fist to bring awareness to his claim that 60 percent of the prison population being “people of color.” His Eagles teammate cornerback De’Vante Bausby also raised a fist in protest. Finally, San Francisco 49ers wide receiver Marquise Goodwin raised a fist in protest during the 49ers matchup with the visiting Dallas Cowboys. There most likely won’t be any repercussions for the players who participated in protests, since the NFL waffled on its new rule that players would be fined for kneeling during the anthem. Fast forward two months later and the NFL — under pressure from the NFL Players Association (NFLPA) — backtracked on their decision and said that the policy would be suspended for now while the league and the NFLPA attempt to hammer out a solution. Translation? "Yeah, we’re not going to do anything about this situation." This is just the beginning of a long season in which we most likely haven’t seen the last of players protesting during the anthem. Buckle up, folks. The 2018 NFL season could be a bumpy ride.